As gardening seasons go, this one has been more full of surprises than usual. My eyes have been opened to just how much water vegetables really need to be happy — and how much more than that they can handle. Thanks to a string of growing seasons filled with long streaks of 100+-degree days and prolonged droughts, I’ve become pretty good at gauging a vegetable’s minimum water requirements. A shallow well for the garden that routinely dried up by August necessitated strict water rationing. Not this year. I don’t think we’ve gone more than 10 days without at least an inch of rain. Fungus flourishes, it’s true, but so does everything else. Canopy-sized trees are still putting on bright new green growth — in early August! Plants are re-blooming at unprecedented rates. As I wander around my yard, I sometimes feel as if I’ve stepped into an alternate universe, so different is this year’s August landscape from previous years. More about that another time. Today I want to offer an overdue update on the vegetable garden. The pole beans in the harvest basket photo above are Fortex. I’ve always had good success with them, but I never realized before this year that they were dying out by July in past years because I just wasn’t giving them enough water. This year, they topped their trellis by the beginning of May, reached the bottom of the other side by the end of June, and now they are heading back up again — at least, mostly. Some seem to be heading horizontally for the next county, despite my attempts to encourage the vines to remain on the trellis. I’m picking a good mess of beans every other day now. It was every day until about three weeks ago, so I guess they are slowing productivity a bit. 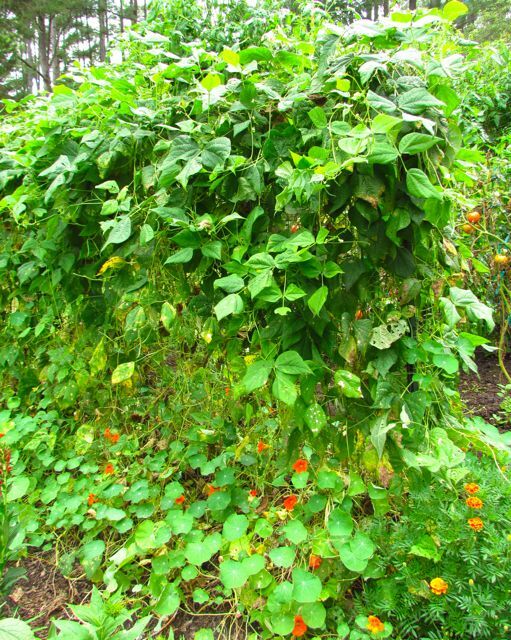 As I did last year, I interplanted the beans with a climbing nasturtium. Last year, the two species played well together, but this year’s abundant water has produced quite the tangled mess of vegetation. The deep orange-red flowers near the bottom are the nasturtiums. Some have climbed higher, just not in this shot. 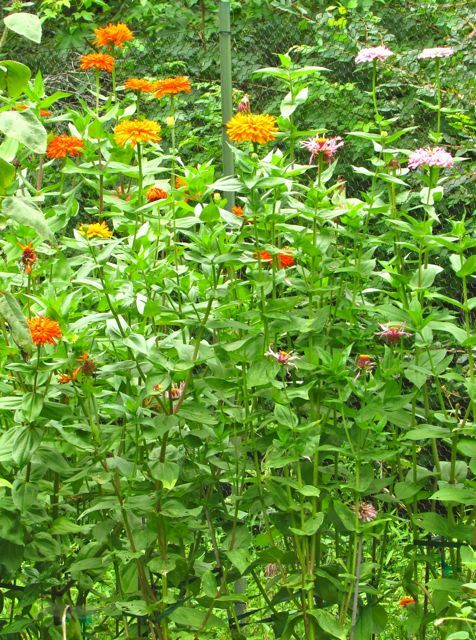 The lighter orange flowers on the far right are Queen Sophia marigolds. As you can see by the harvest basket, I’m also still picking tomatoes, but not nearly as many as in previous years by this time. This wet year has taught me that my organically grown tomatoes stay healthier and more productive during drought years, because the fungal diseases that are plaguing them this year just can’t flourish without abundant rainfall. Limiting their water supply also intensifies the flavor of the tomato fruits. This year’s ‘maters, while tasty, are just not as vibrantly flavorful as in past years. And, yes, I’m mostly growing the same varieties as I had in previous years. 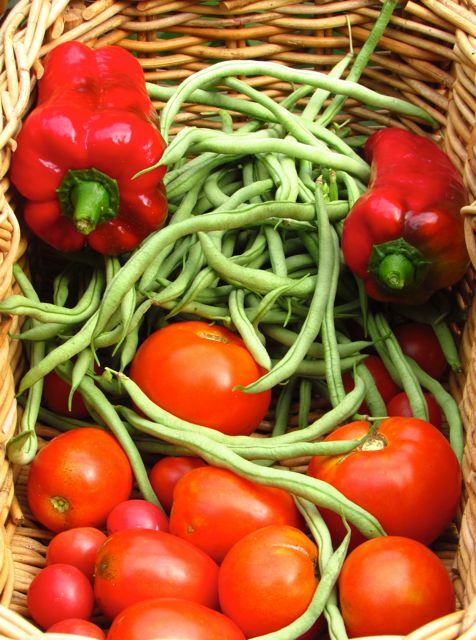 You’ll also see in the basket a couple of sweet Italian peppers — Carmen is the variety name. These beauties are the best-looking veggies in the garden right now. We’re about to be buried in an avalanche of sweet, juicy peppers with just a hint of zing. They are so vibrantly flavorful that I think perhaps I can taste their Vitamin C. So good! 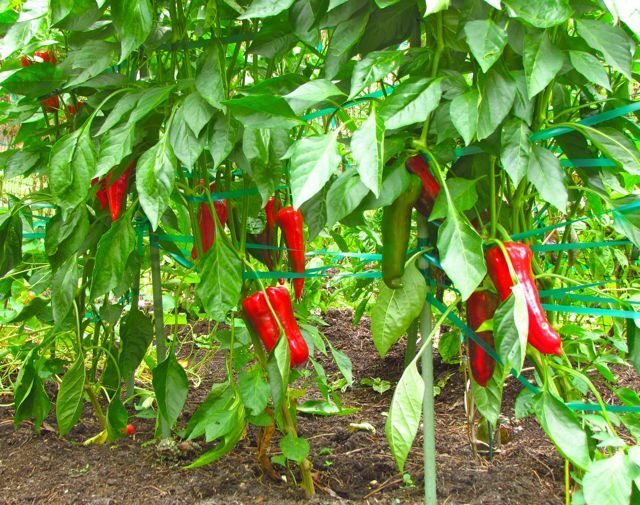 A few more Carmen sweet Italian peppers ripen daily. Luckily, the fruits freeze very well. I’m also growing a few plants from a seed packet of mixed Italian heirloom peppers. So far, one plant has produced a lovely ripe yellow fruit. Another one appears to be turning its fruit orange. Stay tuned for further developments. Additionally, I got a free seed packet for a purple cayenne pepper. Of course, I had to try it, but I did limit myself to growing just one plant. Cayennes are notoriously prolific pepper producers, and my purple-fruited specimen is living up to my past experiences. The purple cayenne’s fruits start out a deep magenta purple, but seem to lighten as they mature. Will they go red when ripe? Stay tuned. The basils are having a great year. Because my vegetable garden is a fair hike from the kitchen, I cut stems of fresh basil and put them in a water-filled vase on the kitchen counter. That way, Wonder Spouse remembers to add leaves to his many wonderful culinary creations. Plus the sweet-spicy scent wafting from the leaves freshens the air. I was worried that the rampant fungal fiesta ongoing in my vegetable garden might hurt the heirloom zinnias or sunflowers that I got from Renee’s Garden Seeds this year. But they are thriving, and have bloomed nonstop since May. I’ll tell you more about this sunflower mix soon. I am in love with these old-fashioned zinnias that have grown taller than me by at least a foot. Other parts of the yard are still blooming too, and I’ll share more in another post. For now, I’ll close with a favorite perennial that I associate with summer’s waning — Cardinal Flower (Lobelia cardinalis). I don’t think one can ever have enough of these in one’s garden — and I’m fairly certain that the hummingbirds and butterflies agree with me. The true red of Cardinal Flower brightens any late-summer landscape. 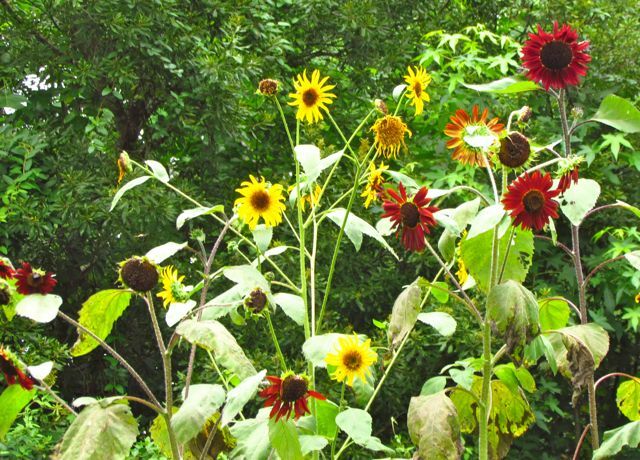 This entry was posted on August 9, 2013, 9:58 am and is filed under Favorite Plants, piedmont gardening, Vegetable Gardening. You can follow any responses to this entry through RSS 2.0. You can skip to the end and leave a response. Pinging is currently not allowed.